For our recent Easter dinner at cousin Jennifer's lovely home in the woods on Clear Bottom Lake, I created a couple of bite size gâteaux for the occasion. I've been on a sesame kick lately, having discovered a terrific way to create sesame brittle, compliments of Yotam Ottolenghi and Helen Goh. More about that in a bit. Rather than cramming a lot of recipe info into one post, I'm doing a two-parter, one part for each little cake. First up is gateau de Pâques, a classic chocolate biscuit for Easter that I've made a number of times and have never found wanting. 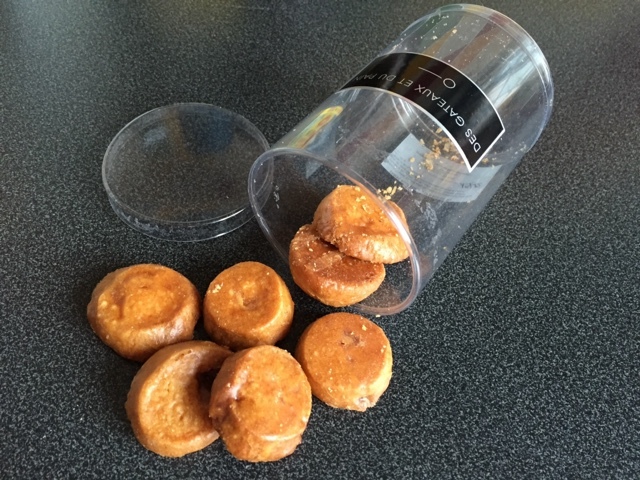 The French word biscuit generally refers to a cake in the sponge family that's made with eggs that are first separated, then the yolks and whites are beaten separately before combining various components at the end to make a light and tasty cake. On the other hand, biscuit sec usually refers to a cookie. In English the word biscuit has a completely different connotation. While the Brits call cookies biscuits (as the French do biscuit sec), we Americans think of shortcake à la buttermilk biscuits or biscuits and gravy. Language is so cool and fun to figure out, don't you think?! 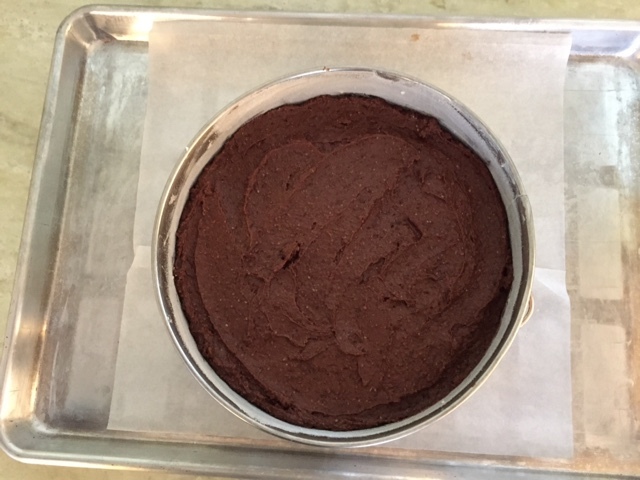 For this fun little cake I used one of my favorite square savarin fleximolds from Silikomart, which allows me to fill the "dent" with something good before garnishing with a swirl of another something good. And then adding another something even better! That sesame brittle is oh-so addicting - just ask Steve. First the sesame brittle, so you'll have it ready to go for the garnish. And it keeps for a number of days. The beauty of this brittle method is you don't have to use a candy thermometer or worry about reaching a certain temperature. I LOVE that! Toast 125 g sesame seeds (mix of 1/3 black and 2/3 white or all white like I did) either in the oven at 325ºF for about 10 minutes until nicely brown, stirring occasionally, or in a skillet on medium-low on the stove top. Do what you're most comfortable with. Set aside. Increase the oven temp to 350ºF. Have two half sheet pans and four pieces of parchment at the ready. In a medium saucepan put 100 g granulated sugar, 100 g light corn syrup, 50 g unsalted butter and 1/8 teaspoon salt. Stirring constantly on high heat, blend the mixture and bring to a boil. Remove from the heat and stir in the toasted sesame seeds. Put two pieces of parchment (or Silpat!) on a heat proof surface (I used two overturned half sheet pans) and pour half of the sesame mixture on each. Cover with the other parchment pieces and roll with a rolling pin until about 1/8 inch thick. Slide the paper with the sesame caramel onto half sheet pans and remove the top layer of parchment. Peel it back gently and push down any caramel that might stick. Bake for about 20 minutes until nicely browned. Remove from oven, cool and break into shards. Stores nicely in single layers between pieces of parchment or waxed paper in a well sealed container. The first batch I made lasted a couple of weeks and served as garnish for a number of goodies! Heat your oven to 350ºF and have your molds of choice at the ready. Butter and flour a 8-9" cake or springform pan OR you can use any shape multi-well silicone flexi-mold (no butter/flour needed) or mini-muffin tins lined with decorative papers. You decide. Melt 200 g dark chocolate (I used 61%) and 200 g unsalted butter gently over a bain marie. I like to do this over very low heat and once the melting has begun, I turn the heat off and let the residual warmth finish the melting process. Stir the mixture every once in awhile as it melts. Once you have that going, separate 4 cold eggs. NOTE: Eggs separate best when cold so do that at the beginning of your prep. The whites will be beaten separately and whip best when warm so it's all part of planning ahead!! In a large bowl whisk the 4 yolks with 150 g sugar until thickened and more pale. Blend in the melted chocolate/butter mixture. Blend in 100 g all purpose flour. In a clean bowl beat the 4 egg whites with a pinch of salt to soft peaks. Gently fold the whites into the the above mixture. Pipe or scoop the mixture into your chosen molds and bake. 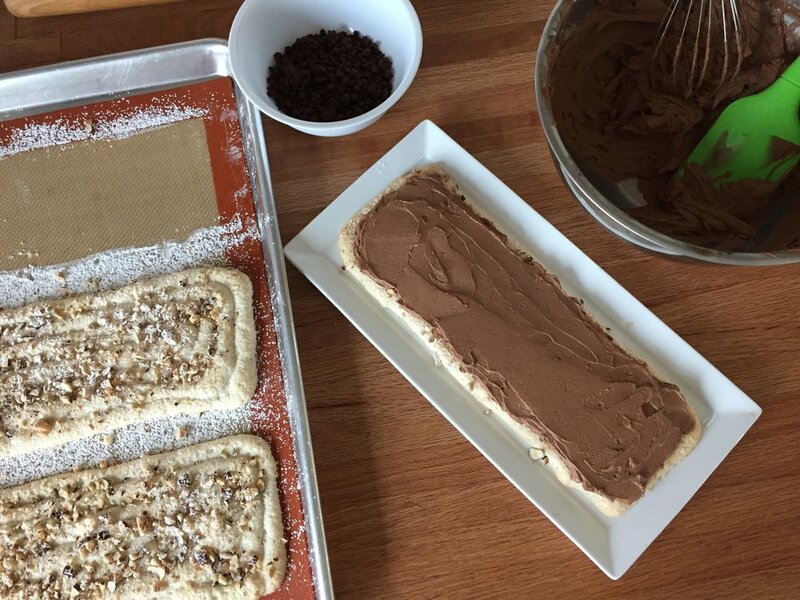 Your baking time will vary depending on the size of your molds. An 8" cake may take about 30 minutes, whereas mini cakes may take about 10. Look for a more dry appearance to the surface of the batter without gooey centers. Let cool and unmold. Garnish with ganache or whatever you'd like! I made a basic 1:1 dark chocolate ganache to fill the wells, then piped a swirl of whipped white chocolate ganache (1:1 cream to chocolate, chilled then whipped) on top and added some shards of sesame brittle. Whew! The texture of these cakes is light and oh so smooth. And the whipped white chocolate ganache and sesame brittle finished 'em off so deliciously. You gotta try these, I'm telling you now. Stay tuned for Part 2: toasted coconut lime cakes! Get ready folks! This one is a four bowl-er!! A family supper at Mom's had me in the dessert planning mode again. I recalled with fond memories this chocolate hazelnut number that I had made a couple of times at my shop in Pawtucket RI for the Saturday morning farmers market. Definitely delicious and worth the extra effort to make. It's very important to plan ahead and do your mise en place for this recipe - pan preparation, butter at room temperature, chopping and melting chocolate, dividing the sugar (pay attention to the recipe!) separating eggs and understanding all the steps of beating and mixing before the whole shebang goes into the pan and the oven. Heat the oven to 375ºF. Butter a 9" springform pan, place a parchment round on the bottom, butter the parchment and sprinkle with sugar. Melt the chopped bittersweet chocolate in a bowl over a bain marie, stirring periodically until smooth; remove from the bain marie and let cool slightly. In a medium bowl whisk together the hazelnut flour, all purpose flour, cocoa powder, salt and 1/4 cup sugar. 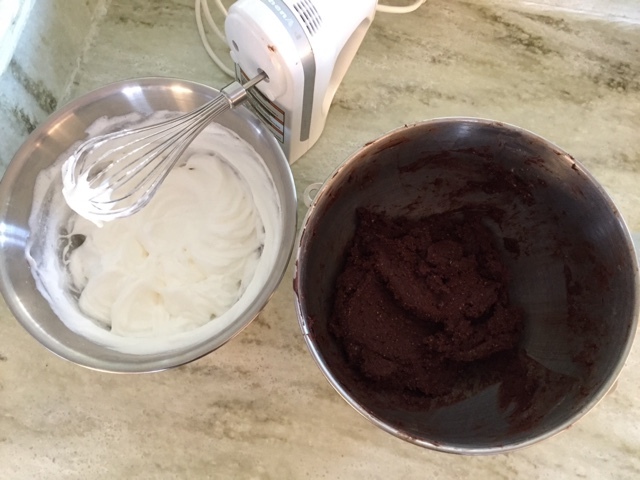 In a mixer with the paddle attachment beat butter with 3/4 cup sugar until light and fluffy, about 3-4 minutes. Add egg yolks, one by one, blending in each addition before adding the next. Beat in vanilla. Blend in melted chocolate then gradually add in dry ingredients, mixing just until combined. In a clean bowl with clean beaters or whisk attachment beat egg whites and cream of tartar to stiff peaks. Now down to two bowls! With a rubber spatula fold 1/3 of the whites into the chocolate batter to loosen it (NOTE: it can get pretty dense as the chocolate cools so don't dilly-dally!). Fold in the remaining whites just until combined. Scrape the batter into the prepared pan. Bake for 20 minutes then reduce the oven temp to 350ºF and bake an additional 30-40 minutes. The top should look dry and may crack a bit and a skewer inserted in the center should come out clean. Let cool about 20 minutes then unmold and cool completely. Once cooled I decided to glaze it with some leftover ganache I had in the fridge. I gently warmed the ganache until spreadable and gave the top some cover. Smooth ganache, dense moist crumb, lovely chocolate-hazelnut balance, cool-creamy ice cream and just a little crunch thrown in. Yes. The other day we visited with our friends Val and Hubert, along with their beautiful and delightful children Arianne and Gabriel. Since we were going to be at their apartment during the le gouter time of day, we stopped at a nearby patisserie to pick up something delicious to share. We had visited Des Gateaux et du Pain once before some years back and were struck by the art gallery like arrangement and presentation of the pastries. As I recall we had tried one of their croissants (OK) as well as a petit pain aux cereales (delicious), but ultimately we were put off by the snobbish behavior of the staff and the fact that they did not allow any photos to be taken. This time I wanted to give it another try, partly because the pastries are indeed works of art, but also because the chef happens to be a woman. Let's hear it for the ladies! We opted for the gateau au chocolats, a triple (or even quadruple!) 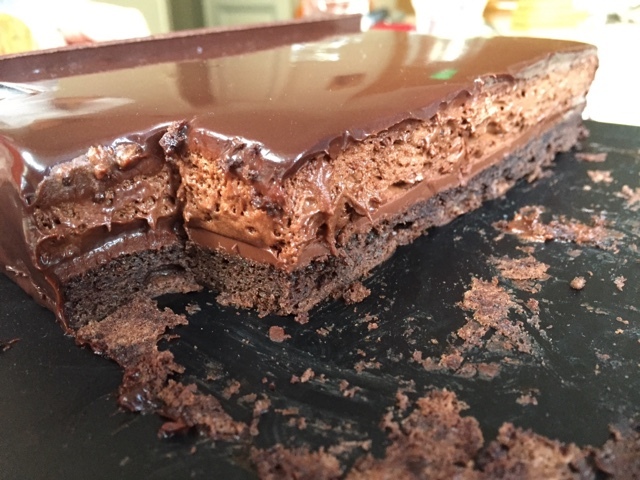 chocolate creation from chef Claire Damon - a base of biscuit au chocolat, then a ganache layer topped with chocolate mousse and finished off with chocolate glaze. Wow. It was delicious! Luscious and chocolate-y yet light and oh-so-good. While we made a pretty good dent into it, there was plenty left over for a split between Val and Hubert and us to take back to our apartment. Oh boy - dessert for the next couple of nights! On a final note, as an accomplished shortbread creator and taster, I simply to had buy some of Claire's sable au caramel et fleur de sel. These were a disappointment. The texture and flavor just weren't there. Sorry Claire! Before I start on the topic at hand, here are some pics of the delectable chocolate bread pudding I made using the left over chocolate croissant spirals from my last post. I diced up the spirals, poured a basic chocolate custard over the pieces in my favorite square C&B ramekins, sprinkled on some vanilla sugar and baked 'em in a water bath. Just imagine one served warm with a scoop of vanilla ice cream. Yes, indeed. Now on to the task at hand. What most of us know as napoleon, mille-feuille (literally "a thousand leaves") is that classic combination of puff pastry layered with vanilla pastry cream. Of course, as is true of pretty much any classic you can think of, there are a multitude of ways to create variations on the theme. Years ago, before pastry school was even a gleam in my eye, I made versions of this dessert using good old Pepperidge Farm puff pastry sheets, cut into squares and baked, then simply layered with a cream or custard and fresh fruit and/or a fruit coulis. Always good. Once pastry school was under my belt and I experienced what Paris had to offer, mille-feuille was often on my tasting hit list. During my stage at Pascal Pinaud's shop on rue Monge in the 5th, raspberry-lemon mille-feuille was offered as a special treat only on Sundays. When done well, the combination of crisp, flaky, buttery puff and smooth and creamy custard can't be beat. Flash forward to the spring of 2013 when I took a class at Christophe Felder's school in Paris on mille-feuille chocolat. I purchased his pastry tome Patisserie! and have been drawn into it lately to refresh myself on the classics as well as get inspiration for some new ideas (new tart coming up soon!). My eyes lit up at the recipe for mille-feuille chocolat and off I went on a trip down feuilletage chocolat lane. 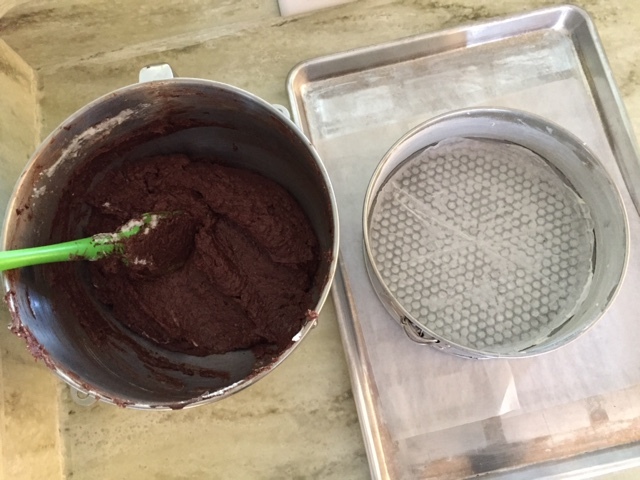 This recipe calls for cocoa powder added to the détrempe, just as in my recent chocolate croissant experiment. I made half a recipe: 250 gm flour, 30 gm cocoa powder, 130 ml cold water, 43 gm melted butter and 5 gm salt mixed together just until everything is incorporated. the creature from the Black Lagoon! The détrempe felt dry, and it looked a lot more blotchy than when I make regular puff pastry. I gave it a couple hour rest in the fridge and prepared the 168 gm butter block. Once I completed the beurrage and started the folds/turns the dough in general started to look a little better, but still blotchy. after the first two turns - yikes! But once all the turns were complete the dough looked and felt better - there was hope after all. I held the dough in the fridge overnight for use the following day. Otherwise I would typically pop it into the freezer for another time. When rolling out the puff for mille-feuille, it's important to roll it about 2-3 mm thick. I divided the dough in two and rolled each piece to fit a quarter sheet pan. It's important to let the dough rest - otherwise it shrinks when baking (as you'll see in the upcoming pictures). It's also a good rule to freeze the rolled out puff for 10 minutes or so before baking to help stabilize the dough. 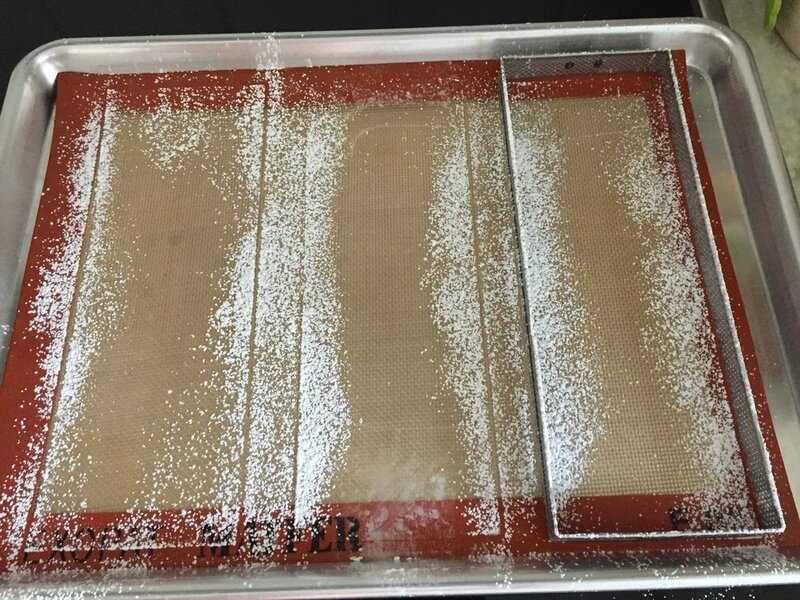 For comparison I baked one quarter sheet with a cooling grid over the pan (seen above) to help limit the puff's rise and the second one topped with a piece of parchment and a second sheet pan to weigh it down (the generally recommended method to keep puff under control). I did NOT prick either one with a fork, having found instructions on line with and without (Felder's approach) fork pricking. What really happened in the oven? The weighted down version puffed anyway, and I actually pushed it down a couple of times during baking to try and keep it flat. The one with the grid over it puffed up to the limits of the grid, but it ended up more irregular with undulating waves across the surface. And both of them shrank. and then a dust of powdered sugar and under the broiler for a couple of minutes to caramelize. 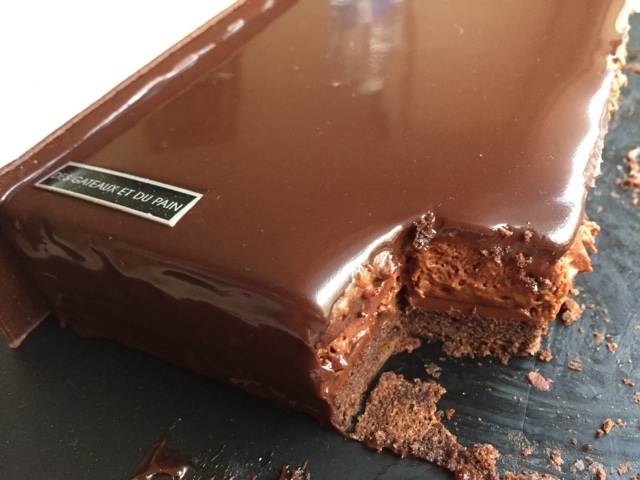 I made a simple whipped ganache filling using 250 gm heavy cream and 70 gm chocolate. While I was piping the first layer I was reminded of the radiatore pasta Steve and I had just eaten a couple of nights before - ruffles! Once all the layers were assembled I popped the whole thing into the fridge for 30 minutes before topping with a basic 1:1 ganache. The result looked pretty cool, but the flavor of the puff was disappointing - rather boring and not terribly chocolatey. I also felt the puff layers were too thick and should have been more crisp and flakey. What would I do differently next time? Use standard puff pastry (not chocolate), roll it more thinly, let it rest longer so as to reduce shrinkage, and prick the dough with a fork before weighing it down and baking it. Steve's reaction? "What's so special about mille-feuille?" OK, OK - back to the drawing board! When I receive a request to make something that I haven't made for awhile, it prompts me to research recipes and re-live those practical kitchen days from pastry school. 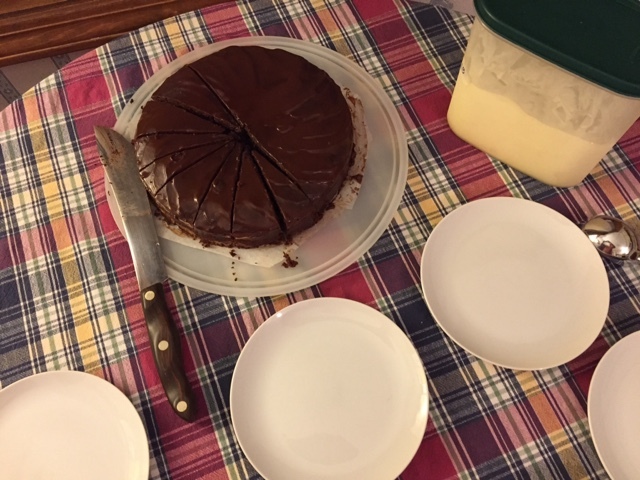 So, since I had an order for this classic Viennese cake, I made a Sacher torte. The story goes that this cake was created in 1832 by a 16 year old apprentice chef, Franz Sacher, for Prince Wenzel von Metternich in Vienna. The Sacher torte has since become a fixture at the Hotel Sacher Vienna, where they say the original recipe remains a secret. Even so, there are numerous recipes out there, each with its own variables. All of them call for bittersweet chocolate, eggs, sugar, flour, butter, a little salt (for mounting the egg whites) and usually some vanilla extract for a standard 9" cake. 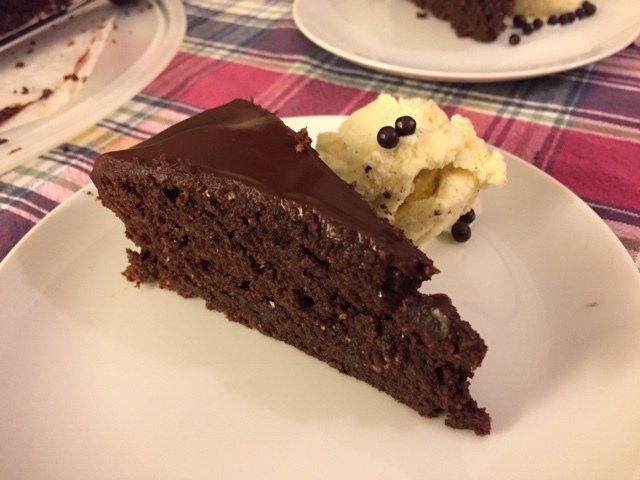 Here are the steps and some of the recipe differences I encountered as I made my way to a Sacher torte! Prep a 9" springform pan by buttering the bottom, covering it with a round of parchment and buttering that. Some folks also flour the parchment - I chose to dust it with cocoa powder. The chocolate is melted over a bain marie and allowed to cool to tepid before it is added a bit later. I'm using a mixture of Valrhona 64% and Trader Joe's "dark" and "72% dark" chocolates. Chocolate quantities vary from recipe to recipe, anywhere from 113-227 gms (4-8 ounces). I used 142 gm. The butter can be melted along with the chocolate, but most recipes seem to prefer creaming it with a portion of the sugar. That's the method I used. Butter quantities ranged from 85-250 gm (3-9 ounces) in the recipes I reviewed. I used 126 gm. My review also revealed sugar amounts from 113-225 gm (1/2 to 1 cup), some recipes using a combination of confectioners sugar (for the creaming step) and granulated sugar (for beating with the egg whites.) As you see above I used confectioner's sugar (50 gm) for the creaming step. This cake is considered a biscuit which means the eggs are separated, and the yolks and whites are beaten separately before blending together. Egg quantities varied from 4 to 8 (most commonly 6) in my review. Some recipes call for whisking the yolks with a portion of the sugar to the ribbon stage, and then adding the melted chocolate and butter. In the method I used here the 6 yolks and a teaspoon of vanilla are blended into the creamed butter and sugar mixture, and then the cooled, melted chocolate is added. Above: adding the chocolate - wheeeee! Next sift the flour (130 gm) over the chocolate mixture and gently fold it in. I found the amount of flour called for was most commonly one cup. However, some recipes use cake flour or cornstarch in place of all purpose, and some use almond flour as a portion of the total flour. Also there were variations in the flour adding step - some did it before and some after the egg whites. Now it's time to whisk the egg whites to soft peaks. Egg whites mount better at room temperature, so I usually separate my eggs early in my mise en place and let the whites start to warm up. Alternatively you can place your bowl of whites in some warm water to speed up the process. I like to start my mixer on low speed and let the whites and salt (1/4 teaspoon) start to foam a bit. Then I slowly add my sugar (112 gm) while the mixer is running, then increase to high to finish them off to soft peaks. Now fold about 1/3 of the whites into the chocolate mixture to lighten it, then gently blend in the remaining whites just until a few streaks remain. Place the batter in the prepared pan. Bake at 350ºF for approximately 35-40 minutes, or until a tester comes out clean. Let it cool a bit, unmold and finish cooling. 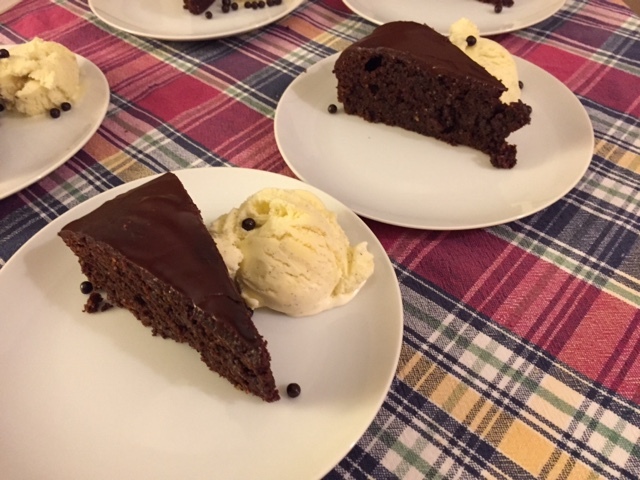 Traditionally the Sacher torte is layered with an apricot jam filling. 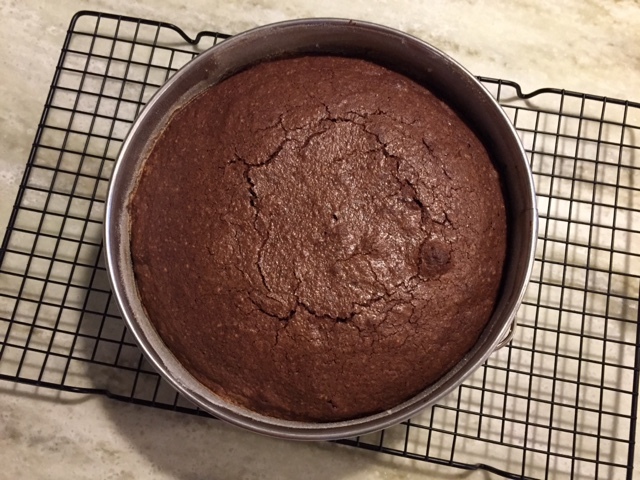 Most recipes called for slicing the cake into two layers, but a few into three. My cake was destined for two. Filing methods include: simply spreading apricot jam between the layers; warming and straining the apricot jam before spreading to remove the chunks (some preferred that for mouth feel); puréeing the jam to de-chunk it; taking a small amount of jam, diluting it with water and puréeing it to use as a glaze on each layer in addition to spreading jam between the layers. Anyway, you get the idea - to each his/her own! All recipes agreed that once the cake is "jammed" (thanks Parks and Rec! ), give it a 30 minute chill before the final chocolate glazing. 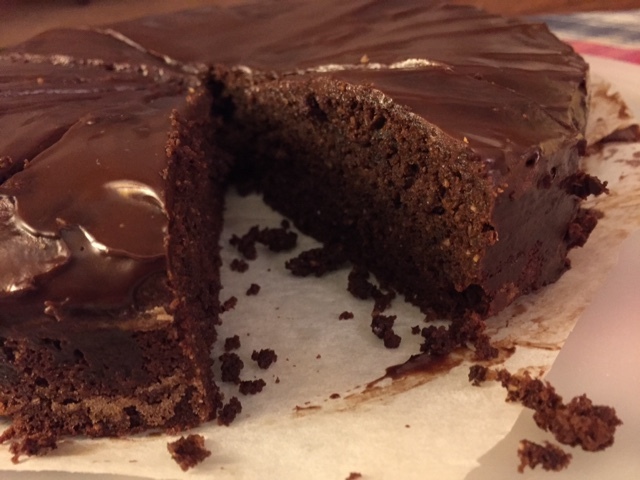 The chocolate glaze recipes varied from the "add boiling water to the chocolate" method to a more traditional chocolate ganache type of glaze. 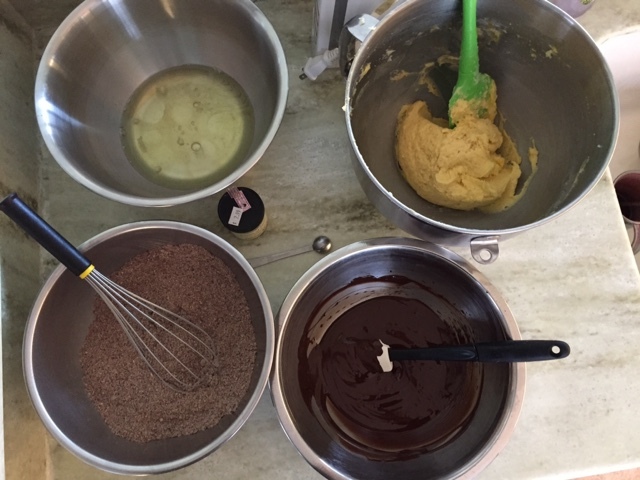 The one I chose was a 3-part chocolate (170 gm) to 1-part cream (56 gm) ganache with a bit of butter (28 gm) added. It had a nice sheen. Now I'll admit I was lazy here and did not follow the tradition of writing the word "Sacher" on the top of the cake. Instead I made my go-to simple swirl design. Thank goodness for my small offset spatula! So choose your recipe and go for it! If I ever get to Vienna and have a chance to try the real thing, I'll let you know! !